Sausage Stuffer | Smoking Meat Forums - The Best Barbecue Discussion Forum On Earth! Discussion in 'Slicers, Grinders, Tools, Equipment' started by Noah, Nov 1, 2018. Looking at purchasing a sausage stuffer and have a few questions for the professionals. 1. Plastic or stainless stuffing funnels? 2. Size of stuffing funnels. I will me making mostly snack sticks, summer sausage and brats. From what I have been researching some people are having a hard time getting a small enough funnel for 19mm casings??? *Vivo- Plastic 10 mm ( 0.4 inch), 20 mm (0.79 inch), 30 mm (1.18 inch) and 40 mm (1.57 inch). *Weston- stainless 13mm, 20mm, 30mm, and 40mm sizes. I'm not familiar with thse stuffers. I've had a LEM 5 lb stuffer with metal gears for several years, and have had no trouble with it. However if I'm making small dia. sticks I add a little extra water to the mix. It really helps to get it thru the small tube. I've got plastic ones and I can't complain. But I will attribute that entirely to how well the casings are prepared. As for the sizes, I have found I don't need nearly as many. Again, a lot depends on how well the casings are prepared. FWIW.. This is worth bringing up again... and again... Makes all the difference! I have a Hakka horizontal stuffer. It's made very sturdy, I've had no complaints! I have the new style lem 5 & 15lbs with the enclosed gears,, first lem (exposed gears) was good but these new ones are awesome!! N, All my tubes are plastic and I've been stuffing for over 30 years with no problems. IMHO a lot of theses stuffers are pretty much the same with different names attached. Have fun ! Not familiar with the first brand, but Weston, Walton & Hakka have been around for a while. Weston probably stands the best chance of still being available for parts 10-15 years from now IMO. But Hakka is usually very decent quality at a lower price. A lot of these seem to come off the same assembly line, but one "brand" may have a little more attention paid to final fit and finish in the quality control department. As long as your casing will fit on the stuffer tube, I don't think it really matters. I will make one point about plastic vs the stainless. The wall of the plastic tubes will generally be much thicker than the metal wall of the stainless tubes. With sticks, that can make a difference with smaller diameter casings. Remember you are cranking a big plunger to force the meat down the funnel base of the tube into that little space to get into the casing. The more space you have (ie, thinner walls of the stuffing tube), the easier it will be. 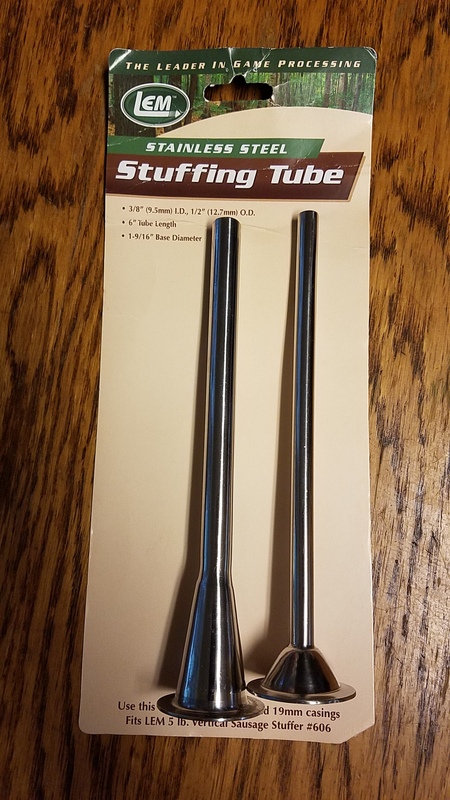 I have a 9mm stainless tube and have used 15mm casings. There is a noticeable difference in stuffing with that 9mm tube than a LEM 3/8" tube. Also some tubes are marketed by their inner diameter and others by the outer diameter of the tube. For anything over snack stick size, that really does not matter that much, but with sticks (especially the smaller ones) it makes a difference. For example the LEM stainless tube is marketed as a 3/8" tube. That is the inner diameter. The outer diameter is actually 1/2". Works just find for 21mm casings, but starts to get tight on 19mm and 17mm is impossible on the LEM tube. I would recommend you stick with 21mm casings for your first couple of stick batches. Once you get the hang of it, you can go smaller if you want. I have the 11# Walton's and it is made very well. I tend to buy things with a "you never know, just in case" attitude. My wife asks when are you going to need that and I say "you never know". With that said.....I will not likely make more than 25#s of sausage a year so the 11# stuffer was probably bigger than I needed. It will crank out a lot of sausage and with the tilt function it fills really easily. The 2 drive gears, one fast and one slow, work really well simply by moving the handle. My first negative comment is it leaves a lot of meat in the horn and stuffing tube. Someone on the forum may have recommendations on how to get that meat into casings but my attempts have not worked well. My only other negative about the Walton's 11#r is that it tends to wobble on its base when you crank the handle. It has holes so it can be mounted to something to prevent movement. I will get a piece of wood and countersink the heads so the wood is flat on the bottom, someday. Other than those comments it is extremely well made and I would not hesitate to recommend it. which model stuffer do you have? LEM has been running a sale, 25% off their Big Bite products. Not sure how long the sale lasts. Lem sale ends 11/4. Very tempting! Ain't it! So many goodies, so little time!! Do any of you guys have problems with this model? The long threaded rod always shreds the plate/plunger (don’t know the exact term) that it screws into in mine and have had to have it replaced a couple times. What am I doing wrong? Be happy to help if I can, could ya post a couple pics if possible? Pic of the rod & plate/plunger where it shreds. Are you talking about the silicon ring that fits over the plunger? Is that the part that shreds? The rod that screws into that hole in the center. Every time I start to crank, the plate will come in contact with the meat, start pushing the meat down, then the plate will start spinning and eventually shred the threads on the plate. In case you guys missed it LEM is running a weekend only promotion of 25% off that ends at 11:59pm EST tonight on the Big Bite tools, for that much of a savings I just pulled the plug on another #22 grinder and got the 30lb motorized stuffer and the big 1000 vac sealer. The coupon code is grind18, I saved a small fortune and got some serious sausage making tools for the money on the way. Pretty excited to try that motorized stuffer out it's going to be a real time saver.